Added by Indo American News on December 17, 2015. 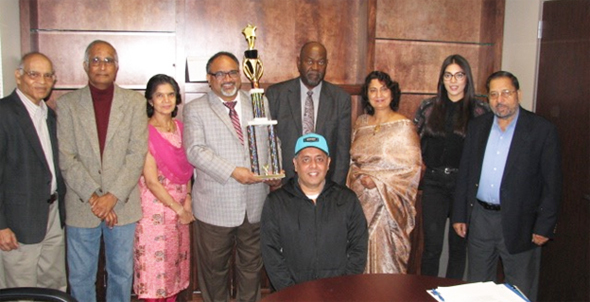 From Left: Krishna Vavilala, Chairman; Dr. Narayana Ponada, Sita Mutyala,Event Chair, Raghavender Nednur, Charles Stamps, Chairman and CEO of MLK Events-Midtown, Dr. Sarita Mehta, Alpa Patel, Community Outreach Coordinator for Houston City Council woman Brenda Stardig and Sashidhar Nair. Sitting: Sanjay Ghakar. HOUSTON: The MLK Grand Marshall Award citation letter read: “This Is to Inform You the Foundation for India Studies (FIS) Has Been Selected to Receive Our Organization’s Highest Award. The MLK Grand Marshal’s Award is Presented To Those Organizations And Individuals That Have Demonstrated The Doctrines And Principles Of Gandhi And King Through Their Daily Activities And Life Styles, And For Embracing Cultural Diversity As A Means Of Social Change. The Award was sponsored by Mr.Ben Hall, the Grand Marshal of the event who was also a contestant in the recently held Mayoral elections. While presenting the Award, Mr. Charles Stamps, President and CEO of MLK Events-Midtown Houston,in his address to FIS Board members on December 5th.at Hamni Bank, stated that he was amazed to see Mahatma Gandhi’s early work and influence in South Africa during his recent visit to that country. He said the MLK Grande Parade contributes about $36 million to Houston’s economy. By participating in the Annual MLK Parades, Foundation for India Studies (FIS) seeks to connect the Indian community with main street America at the grass roots level since Martin Luther King Jr. had followed principles of Non-Violence championed by India’s icon, Mahatma Gandhi. “IT TAKES A VILLAGE” is the theme of 2016 MLK Grande Parade which will take place in downtown on January 18, 2016, which is a declared public holiday to observe Martin Luther King Jr.’s birthday. The parade will originate at San Jacinto street and Elgin Street and starts at 10.00AM. More details are available on website: http://www.mlkgrandeparade.org/. All are welcome to join in the parade. Please contact the Event Chair, Raghavender Nednur 713-927-8126 / email: raghu4asie@gmail.com. The first 50 participants reaching the venue will receive FREE T-shirts sponsored by METLIFE Insurance Co.